If you were involved in a Michigan car accident, there are several claims that you can file for injuries and property damage after the crash. The amount of each claim depends on a number of factors, including the type of harm caused by the accident, which driver was at fault, and the type of insurance coverage in effect on the date of the accident. Listed below are five claims that you can file after an auto accident in Michigan. No-Fault Insurance Benefits (PIP) - These are claims for medical expenses, lost wages, attendant care services, household services, home modifications, and transportation expenses. In the event of death, a claim for survivor loss benefits can be made against the insurance company. Personal Injury Damages - These are claims for injuries suffered in the accident, which include pain and suffering, loss of enjoyment of life, and permanent scarring and disfigurement. In the case of a fatal car accident, the surviving family members can file a wrongful death lawsuit. Uninsured Motorist Claim - These claims are made when you were injured due to the negligent driving of someone without auto insurance. You can often make a claim against your own insurance policy or someone else's policy. Your policy must have this specific type of coverage. Underinsured Motorists Claim - These claims are made against your own insurance policy if you were injured by a negligent driver with low insurance policy limits. Your policy must have this specific type of coverage. Property Damage Claim - This claim is for damage to the vehicle and other property damaged or destroyed by the accident. The amount of money you can retrieve is dependent on the type of insurance coverage that you purchased for your vehicle. You can collect up to $1000.00 from the at fault driver under the Michigan mini-tort law. 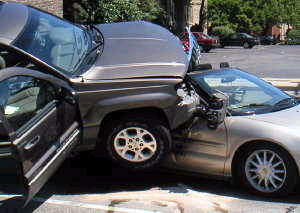 After your accident, you should notify your insurance company as soon as possible to preserve your claims. Obviously, seeking medical attention if the most important thing to do first. You will then want to take photographs of the property damage to the vehicle and also any injuries. If you can get contact information of eye witnesses, this may be valuable later on down the line. Finally, you will want to complete all necessary forms for the insurance company and send them to the adjuster as soon as possible. If you were in a Michigan car accident and have questions about these five claims or any other matter, call our experienced auto accident attorneys today at (800) 606-1717. We will listen to your story and tell you how we can help you with your claims. We do not charge anything for your phone call and will give you free advice on how to handle all of your claims.